The Subaru Outback is a premium all-wheel sports utility vehicle that comes with excellent specs. It has a lift gate rear cargo access, led brake lights, lip spoiler and roof rack among many of its awesome features. 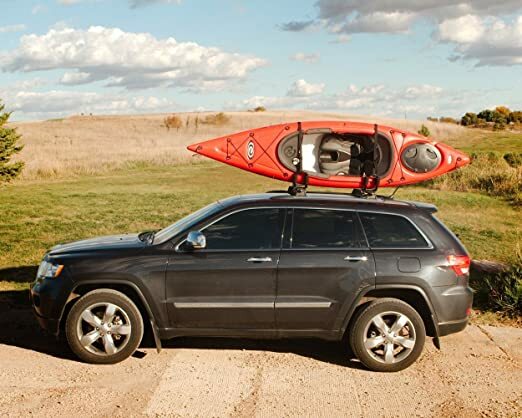 For kayaking enthusiasts, the roof rack is a great addition to an otherwise superior vehicle. The Outback comes with the cross bars embedded in the roof rack system that comes with the vehicle. This is only for the Outback from 2010 onwards. The cross bars are locked down on the lengthwise carriers but you can detach them on one end and fix this end across onto the other side. This then allows you to fix your kayak carrier onto the cross bars. It is a great help to have these as you will not need to incur extra expense getting them as extras. Once you are done using them you will return them to their original position and have reduced resistance while you drive. 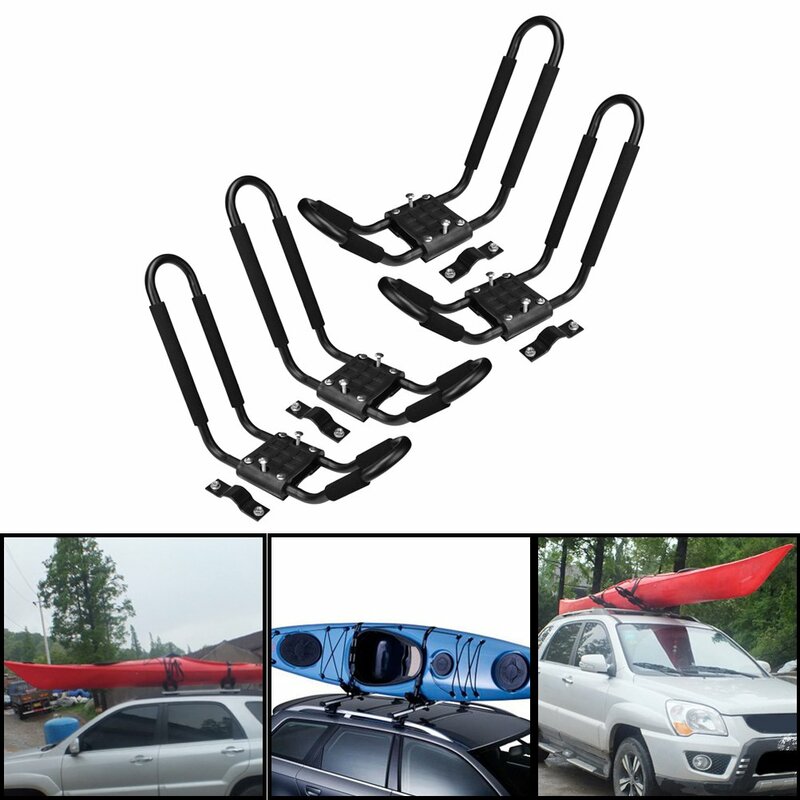 One of the advantages of having inbuilt racks on your vehicle is that you will not need to buy cross bars along with the kayak carrier you purchase. You just need to get a model that fits onto these bars. However you can also purchase a multi-purpose base carrier system that will allow you to attach longer cross bars and carry more crafts. There are many craft carriers available in the market. The type you get and the number of crafts you want to carry will determine the one you purchase. Some of these models allow for crafts to be carried while tilted on the side. This allows you to carry more than one. Others will transport the craft right side up or upside down making it possible to carry only one. Choosing a carrier will require that you know what features are important to you. Most racks will come in strong steel material, have anti-rust coating, and have all hardware required for assembly, an instruction manual and warranty. There are some which offer helpful extras such as adjustable carriers which rotate down for garage access and up for transporting a craft. These racks come in two pairs with the J style design. 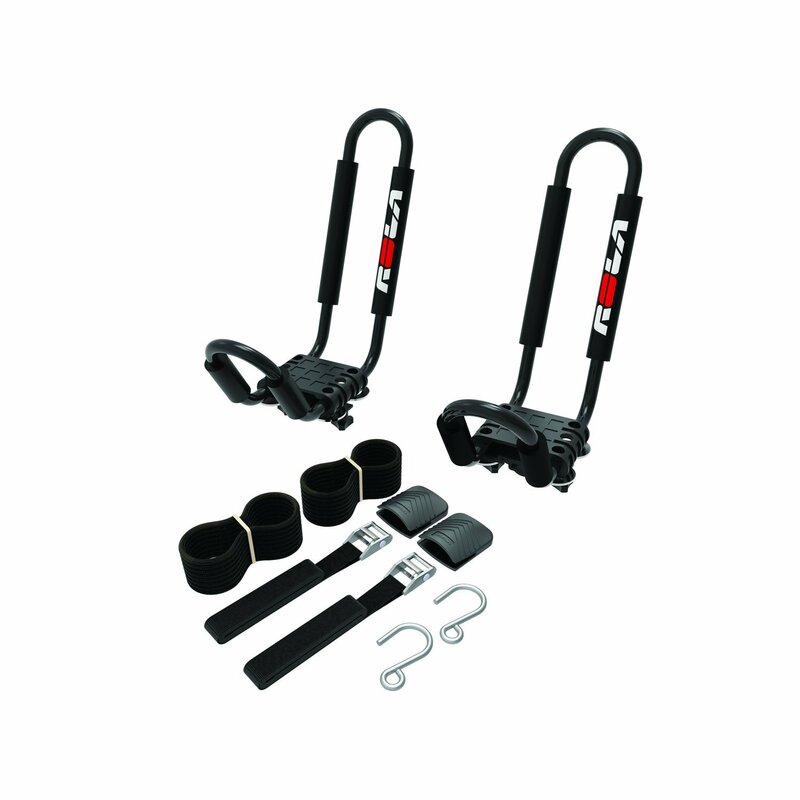 They have four tie- down straps and hardware that is easy to put on and off. They can accommodate 36 inches width and carry up to 75 pounds. The carriers can be fit onto cross bars that are square, oval or flat. In addition to all these, they have adjustable padding to protect your craft as well as increase the carrying strength. The carriers and the hardware are made of strong quality material. They will thus last long and you can carry heavy crafts on them. They are very affordable. The price on Amazon is way below common name brands. They come in two pairs allowing you to carry more than one craft. Some people carry three crafts with these carriers. Two of them face outward and one is stuck in the middle. However two is an ideal number to carry. They take long to assemble and the instructions given are not very easy to understand. The padding wears off quite fast. You may need to replace this especially of going on a long trip. However for the price that is offered, this will not be a major setback. The straps provide may not be adequate when carrying your craft and you may need to bolster them with addition ratchet straps. 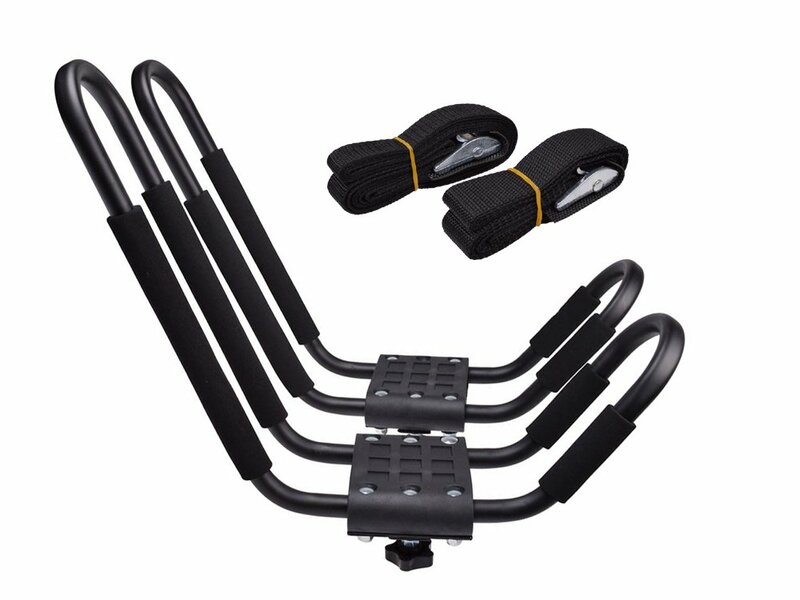 These J style bars are made of strong steel material with the J design being set wide mouthed for ease of loading and unloading. It comes with all the hardware for installation and can accommodate 75 pounds weight and 36 inches width. The carrier also has adjustable padding in place. They are easy to install and easy to remove. You do not have to be tech-savvy to install these. They come at a cheap price. They are long lasting because of the durable material. The 75 lbs capacity will allow you to carry more than one craft, or a craft and camping gear. The adjustable padding offered here is great for protecting your craft during transportation. You will also be protecting your car with this padding. The instructions that come with these are very poor and so is the diagram accompanying them. If you have no experience with this, this can cause a lot of frustration. You will need to replace some of the tools coming with the set as they are not strong enough for assembling. For example, a stronger wrench will have to be sought. The straps must be replaced as it is impossible to keep them tight. They seem to stretch when you tighten them and so cannot be relied upon to keep your craft safe. These carriers are offered as two pairs in the J-style and can carry two crafts. They come with 8 inch straps which can be used to secure a 36 inch wide craft. The design is made of steel including the mounting hardware. They can fit most cross bars except round and oval shaped bars. The price is friendly and also a fraction of the price of name brands. The price also stands out because the offer comes with two pairs. They are easy to install and mount. The installation is fairly easy even for someone without any experience. The two pairs offered here will enable you to carry more than one craft on your Outback. They are not a universal fit and will not fit on round or oval cross bars. They are not rust resistant. Have some rust resistant paint on hand as you may have to coat them yourself. This is one of the high quality craft carriers you will find on Amazon. It is made of very strong steel with powder coating to resist rust and last for a long time. It has foam pads for extra strength and craft protection and is compatible with universal hardware. This carrier also comes with heavy duty straps and tie-downs for the bow or stern. They are made from very high quality material that is long lasting. They are made from high density powder coated steel which is very strong. They attach with wing-nuts by hand making it easy for anyone to attach them. No tools are required for this installation. They work on almost all types of crossbars. The instructions are accessed online and you will have to print them out. You can overcome this setback by downloading them onto your phone or iPad. This way you can access them during installation. The bolts may be loner than you need and might need replacing. 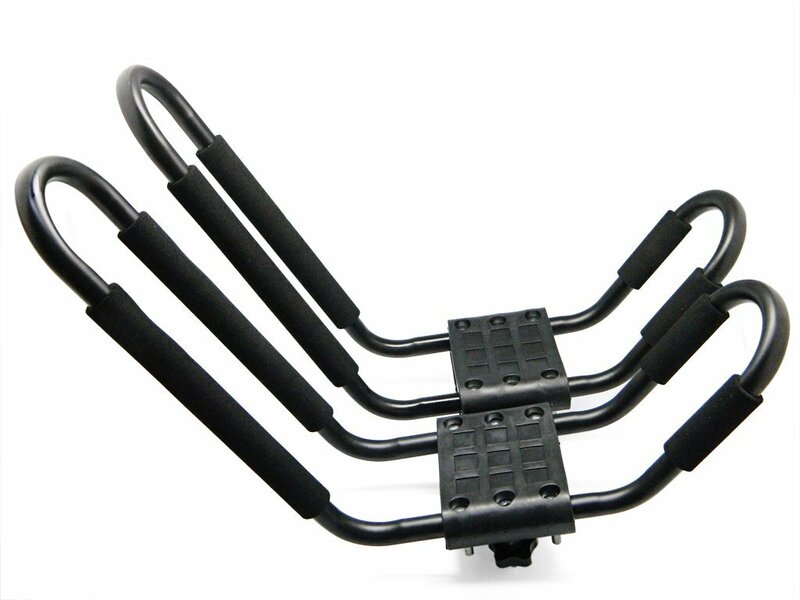 This type of carrier can be used on most cross bars and load bars. It comes with all the mounting hardware plus two nylon tie-downs. The material is made of high strength steel and installation is tool-free. The coating on all the hardware makes it rust-free and therefore long lasting. Crafts of not more than 36 inches wide and weighing 75 lbs can be accommodated. They are easy to assemble and attach. They come at a fairly cheap price. They are made of steel making them very strong and durable. The straps are not of high quality material. They are very weak and must be replaced. The brands listed above are some of the brands that come cheap. Some parts may need to be replaced such as tools and some bolts. Having on hand some rust-resistant paint is also a good idea. The price of these additions will still be nowhere near the higher priced name brands. The ultimate goal is to get craft carriers that work well and last long. You will be able to achieve this with these brands. You pocket will not suffer much from choosing them either. 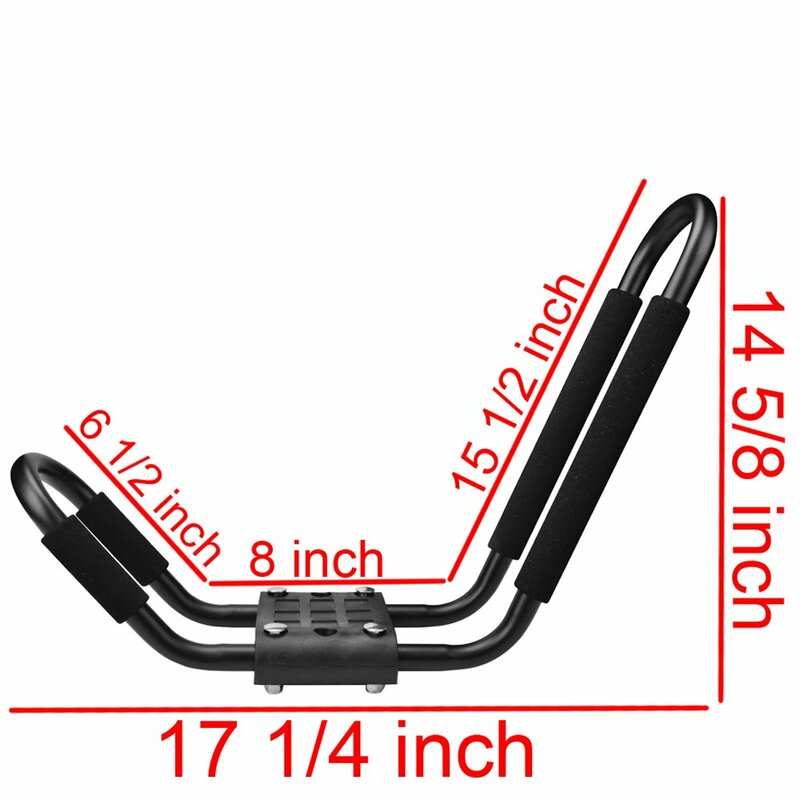 Thule Aeroblade arb53 reviews (Reviews Crossbar for Kayak Rack).